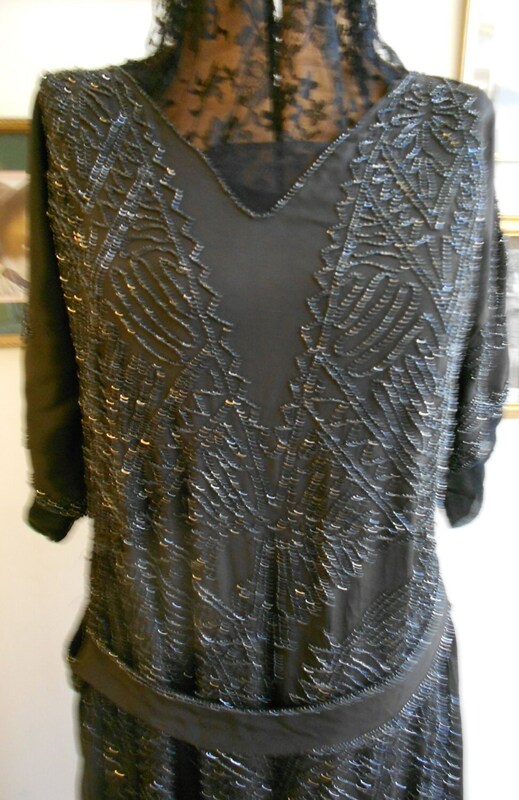 1920's, 38" bust, light weight black silk crepe gown entirely sewn in iridescent black glass beaded Art Deco abstract geometric design, from shoulder to hem. A matching sash edged in the same beads is attached to the gown at upper hip. Neckline of gown is open to a small V, with a modesty of black chiffon at the bottom of the V, neckline is edged with a single row of iridescent beads. The gown has short raglan sleeves, covered with the same beaded motif, edged in a narrow band of chiffon. Bodice falls straight to hem, and is completely covered in beading. The sides of skirt are the only area to be devoid of beading. The same narrow chiffon is attached to bottom of hem. Label reads "Stewart & CO., 5th Ave., New York". hips 38" lower hips 44"